Do you know how to clean your retainer? So you have finished your orthodontic treatment and now have beautiful straight teeth you always wanted but hard work does not finish there. In order for your teeth to stay that way your dentist will recommend a retainer to wear. Most probably a combination of fixed and removable retainer. The removable retainer will require some care from your end to ensure it will last you as long as possible. You would probably never consider going days without brushing your teeth… What about your retainer? Remember that the same bacteria that build up on teeth will grow on your retainer! When to clean my retainer? How to clean my removable retainer? Clean it with special retainer cleaning pills (for example ‘Retainer Brite’). 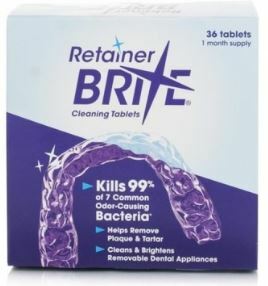 Retainer cleaning pills, how to use them? Simply put your retainer in a glass/bowl and cover it with warm water. When blue water clears (it might take around 10-15 minutes) take your retainer out and rinse your retainer under running water. Now it is ready to use again. Pop in to Smile Cliniq, you can purchase them at our place! How to clean my fixed retainer? Brush! – Just brush it thoroughly! Take your time to make sure you clean it properly. Be thorough but also be gentle not to damage or break your wire retainer. Floss! – You can use special dental floss called SuperFloss. This floss has a stiffened end and a spongy part. Because of stiffed end you can easily insert the floss between your teeth. Spongy part will gently remove all the plaque, build up and food debris from between your teeth and retainer wire. Pop in to Smile Cliniq, you can purchase it at our place! Waterpik! – This will jet wash from in between your teeth and around the retainer to rinse out any plaque, build up and food debris. Regular appointments with your Hygienist! – Visit your Hygienist regularly every 3-6 months. Not only she will perform professional oral hygiene for you and make sure your teeth and retainer is taken care of but she will also give you good oral hygiene advise. We will be happy to see you at our St John’s Wood Branch and Finchley Branch.